Desmoid tumors account for 0.03% of all neoplasms, and 3.0% of all soft tissue tumors . There are five reported cases of DT formation soon after laminectomy in patients without a unique predisposing condition . A 57-year-old woman presented with lower extremity clumsiness, balance, and ambulation difficulty resulting from spinal cord compression due to an upper thoracic intramedullary neurinoma. Two years after neurosurgical resection of this lesion, the patient developed a growing mass at the rostral end of the incision. Biopsy revealed desmoid fibromatosis. The mass was removed via an en bloc resection. Histology revealed an infiltrative Desmoid Tumor above the laminectomy site. Desmoid tumors (DTs), also known as aggressive fibromatoses, are characterized as rare, slow-growing tumors. It has a tendency to infiltrate surrounding tissue. The term 'desmoid', derived from the Greek "desmos" which means tendon-like was first employed by Müller in 1838 . DTs typically develop sporadically, often in the abdomen, hip/buttocks area, and shoulder girdle. A particularly rare subset of these cases includes DTs that develop adjacent to the spinal column. A total of five reported cases have described this phenomenon in the absence of Gardner syndrome, a variant of familial adenomatous polyposis (FAP), or any other predisposing genetic diseases . This report describes an instance of postoperative aggressive fibromatosis that developed two years after neurosurgical resection of an upper thoracic intramedullary neurinoma. 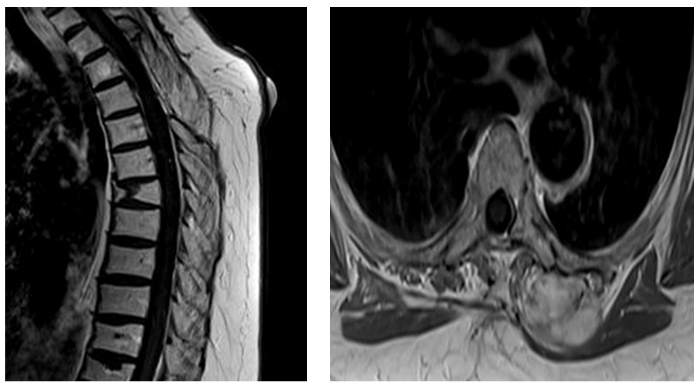 A 57-year-old woman presented with lower extremity clumsiness, balance, and ambulation difficulty resulting from spinal cord compression due to an upper thoracic intramedullary neurinoma. 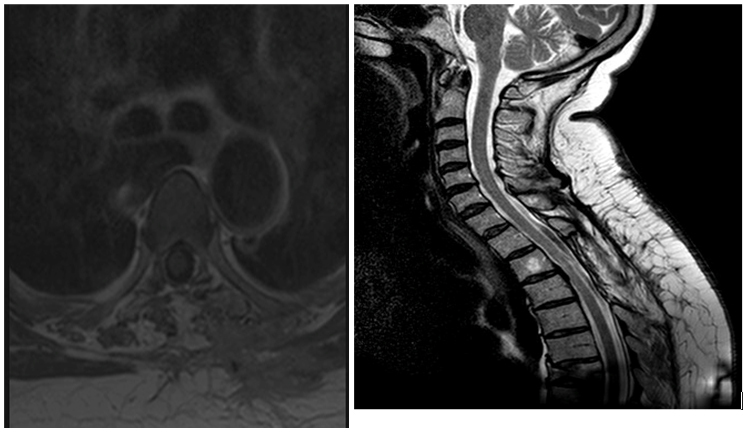 The patient underwent neurosurgical procedure of D2-D3 laminectomy with removal of the lesion. Two years after neurosurgical resection of this lesion, the patient developed a growing mass at the rostral end of the incision. A mass reported by the patient to have enlarged was found on palpation, just superior to the surgical incision. As the mass continued to grow, the patient suffered from increasing local pain and pressure, but there were no neurological deficits. Magnetic resonance imaging (MRI) revealed a T2 hyperintense mass within the right subcutaneous tissues and paraspinal muscles at the T1–T3 levels. The tumor was removed via an en bloc resection (Figures 1a and 1b). The firm rubbery mass was in some areas histologically compact and appeared to exclude preexisting elements. Elsewhere was infiltrative and trapped skeletal muscle fibers and adipose tissue. Histopathologic specimen demonstrating spindle cell prolifer- ation without significant atypia or pleomorphism. Figure 1. Magnetic resonance imaging (MRI) revealed a T2 hyperintense mass within the right subcutaneous tissues and paraspinal muscles at the T1–T3 levels. Serial MRI was performed to follow for tumor recurrence. At 2-year follow-up, there has been no evidence of recurrent disease (Figures 2a and 2b). Desmoid tumors account for 0.03% of all neoplasms, and 3.0% of all soft tissue tumors . The etiology of these tumors is likely multifactorial. Genetic, endocrine, and physical factors play a role because abdominal wall tumors often arise in young parous women following childbirth or in a postsurgical scar. DTs also occur commonly as part of hereditary syndromes, such as familial adenoma- tous polyposis (FAP), which are often associated with a germ- line mutation in the adenomatosis polyposis coli (APC) gene. There are five reported cases of DT formation soon after laminectomy in patients without a unique predisposing condition [5,6]. The reported female: male ratio for sporadic desmoid tumors is 5:2; most women are affected during or after pregnancy. Reitamo et al., found that 80% of desmoid tumors occur in females, 50% of them in the third to fifth decade of life. It has been previously suggested that aggressive fibromatosis may be hormonally related. In fact, middle- aged mothers may be at heightened risk because of characteristic hormone profiles. The number of reported cases of paraspinous aggressive fibromatosis cases occurring postlaminectomy indicates that this may not be as rare of a phenomenon as originally suspected. The scar tissue surrounding a laminectomy may be predisposed to neoplastic transformation due to underlying inflammation from both the treated malignancy and tissue manipulation from surgery [7,8]. A study by Lazar et al demonstrated that 85% of sporadic DTs have mutations in the CTNNB1 gene, which encodes β-catenin. Furthermore, different CTNNB1 mutations were associated with differing rates of progression and recurrence . The treatment of desmoid tumors is usually surgical. Local recurrences may occur even after clear margin resection. Distant metastases are extremely rare. This was seen to be the best option given the high local recurrence rate associated with positive margin resections (54% over 10 years) as compared with those with negative margins (27% over 10 years). If the mass were located proximal to functionally important ana- tomic entities such that negative margins were impossible to achieve, adjuvant radiation therapy (25% recurrence over 10 years) would have been another option. Local recurrences may occur even after clear margin resection. Distant metastases are extremely rare . Middle-aged women undergoing laminectomies have been observed to develop postoperative DTs of the spine. Although these tumors do not cause neurological deficits, they tend to be locally invasive and are best treated with wide excision with negative margins. The post-injury local reparatory mechanisms better explain the creation of desmoid tumors, which, in these rare cases, seem to have lost control of cell growth, giving rise to a soft tissue tumor. The rarity of desmoid tumor, its specific biology, the well-documented associ- ation between abdominal wall desmoids and preg- nancy, and even the tendency of surgery to induce new desmoid tumors in patients with FAP support the notion that trauma/tissue injury is a likely cause of at least, some of these tumors, including the one described here. ©2015 Rispoli R.This is an open-access article distributed under the terms of the Creative Commons Attribution License, which permits unrestricted use, distribution, and reproduction in any medium, provided the original author and source are credited. Department of Neurosurgery, “S.Maria” Hospital-Terni, Italy.